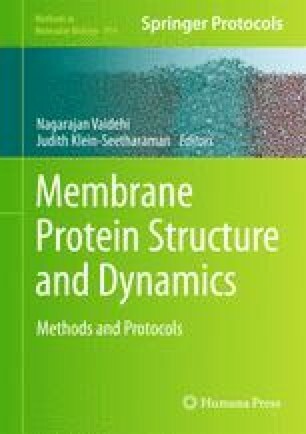 Detection of weak ligand binding to membrane-spanning proteins, such as receptor proteins at low physiological concentrations, poses serious experimental challenges. Saturation transfer difference nuclear magnetic resonance (STD-NMR) spectroscopy offers an excellent way to surmount these problems. As the name suggests, magnetization transferred from the receptor to its bound ligand is measured by directly observing NMR signals from the ligand itself. Low-power irradiation is applied to a 1H NMR spectral region containing protein signals but no ligand signals. This irradiation spreads quickly throughout the membrane protein by the process of spin diffusion and saturates all protein 1H NMR signals. 1H NMR signals from a ligand bound transiently to the membrane protein become saturated and, upon dissociation, serve to decrease the intensity of the 1H NMR signals measured from the pool of free ligand. The experiment is repeated with the irradiation pulse placed outside the spectral region of protein and ligand, a condition that does not lead to saturation transfer to the ligand. The two resulting spectra are subtracted to yield the difference spectrum. As an illustration of the methodology, we review here STD-NMR experiments designed to investigate binding of ligands to the human sweet taste receptor, a member of the large family of G-protein-coupled receptors. Sweetener molecules bind to the sweet receptor with low affinity but high specificity and lead to a variety of physiological responses. This research was supported by NIH grants R21 DC008805 to MM and FAP, R01 DC009018 and Wisconsin Institute of Discovery Grant (WID-135A039) to FAP, R01 DC006696, R01 DC008301 to MM, and P41 RR02301 which funds the National Magnetic Resonance Facility at Madison. We thank Drs. Marco Tonelli and Roger Chylla for their helpful discussions and assistance with the Newton program developed by Dr. Chylla. We thank the NutraSweet Company for providing the sample of neotame.